Says Blake, "Each song on the album stands on its own, but there's a story there if you listen from start to finish. There's a longing portrayed in the first few songs, which is briefly resolved before turning to feelings of regret and loss by the end of the album." 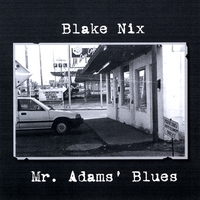 With an accessible yet reflective sound, Mr. Adams' Blues is the kind of album that lends itself to both first and repeated listens.